Zenth is a large, roughly cross shaped continent stretching from sweltering, arid desert in the north to ice-clad taiga to the south. The heartlands from the five lakes of the Great Basin to the deep and fertile Medraphayrus Valley are a patchwork of farmland, mine, lumber camps and city, bent to the will of its orcish masters, while the eastern and western coasts are sparsely populated and left to the dominion of those with the will and strength to make their own stake upon the world. Far to the north the continent stretches beyond the great northern desert into unknown wastelands, and to the south the frozen sub-continent of Calerath awaits those of hardy constitution and great determination. Already the dwarves, ever testing their stoicism and fortitude in the face of hardship, have established themselves in towering mountains, and the sheet ice and polar extremes of the south seem set to be their next great challenge. The northern expanses of the great Padishar Empire are home still to the crumbling ruins of the lost civilization of the humans, a great caves and rents filled with the artefacts of their ancient society, as well as crude paintings on rock walls are all that remain to evidence their short time in the world. These sparsely settled lands have a sinister reputation, and many whisper that the forlorn human gods still weep somewhere in the hidden recessed of those jagged and rocky downs. Zenth is diverse. Cultured and civilized in some places, wild and reckless in others. It is a land of hardship, or glory, of adventure and of sorrow where racial tensions boil and conflict and bloodshed are all too common reminders of how taught and delicate the peace of the five races truly is. Zenth's northlands stretch from the furthest reaches of the Northern Desert the elves of that expanse have explored, a mere few days north of the tip of the Daaland Mountains, south to the Desolate Margins that once housed the human tribes, and the enormous Brambwyn Wood, home to the Golden Court, greatest of the dryad nations. In the east it reaches to the Samdur Vapa and the shores of the Tradewind Ocean; in the west De'Kisehr Bay, the pirate-haunted Bay of Corsairs; along the jagged shoreline along to the wreck-strewn Carrion Coast; and west into the unknown. The Daalands separate the heartland from the western coast, and the embattled Clashlands, nominally a part of the great Empire of the Shars, but in truth the site of a bloody shadow war, mark the southwestern extreme. The deserts are an arid expanse of ever-shifting sand, with occasional outcroppings of wind-blasted rock, giving way to orange mesas in the west, rising up like ruined mountains or fallen giants from the barren landscape. While the desert stretches to the west, its heart is the enormous saline lake known as the Sea of Salt, where elves gather one of their few tradable assets; the coarse rock salt that keeps their food fresh on long treks across the desert. The communal salt pans, where water is gathered and allowed to evaporate leaving great ploughed fields of raw salt, are ever stocked and rich for the next elf who comes along. To the west and the east the sands can only be crossed by a running elf, or by the uncanny Da'Janah that drive their hulls through dunes as easily as ocean waves. Lashing winds blow up vicious sandstorms, and an unforgiving sun, and cold uncaring night are danger enough here, but below the shifting landscape massive sand dragons slither, half slumbering, waiting for the vibration of passing prey above. The elves hold the great desert proudly, claiming that none have ever breached its borders, though the hidden truth of this boast is that none have ever cared to try. The Bay of Corsairs and the Clashlands are a major mixing pot of cultures, where dwarves from the mountains, mingle with elves fresh out of the desert in sprawling orc-built cities, watched from the shadows by goblin freedom fighters. Perhaps it is not surprising that piracy, brigandage, insurgence and open warfare are more common here than anywhere else in the world. Outlaws, rebels and deserters find ample hiding places, and opportunity amongst the chaos, and the orcish overlords here - cut off as they are from the political hub of the Empire, are more focused on maintaining their strength and influence than engaging in petty squabbles amongst one another. Still, many fall to poisoned khukuri or carefully planned accident. The steep and unwelcoming foothills of the Daalands are a wall against which the orcs of the Clashlands press their backs and close their ranks. The Daalands, by contrast, are the most populous and ancient site of dwarven settlement, rivaled in antiquity and importance only by the sacred peak of Tombe's Ascent far to the south. These mountains are some of the lowest of Zenth, but they are broad, and their passes are safe, and seldom choked with snow or buried under avalanche even in the deep of winter. The River that Shows the Reflection of the Nebulous Mandala, better known by its old goblin name, the river Vidur, carves a massive fertile valley with its sweeping flood planes, and this is one of wealthiest and most populous regions of any dwarven lands. 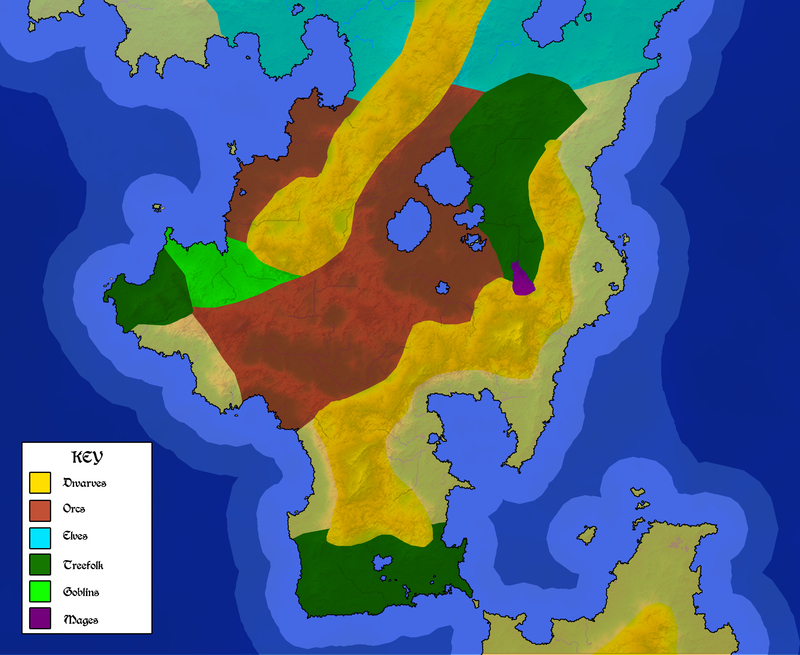 The free cities of Saana and Isuk are both situated on high overlooks, well above the summer floodwaters. On the western slopes of Daalands, the haunted Desolate Margins, uncharacteristically thinly populated by their orc overlords - though still dense in comparison to any other race - host the passage north to the Northern Desert, where elven traders flow south to the heartlands, and north to their deserts, past the walls of the fortified city of Baddhet. The Margins are stalked by strange, animalistic individuals who have succumbed to soul sickness, and degraded to bestial fanatics who cluster around haunted human ruins, going forth only to commit unspeakable atrocities against those who cross their path. The land here is jagged and broken, with great cracks in the earth and sudden jagged outcroppings, hills rent in two and trees blasted by storms, as if the land were somehow mirroring the fracturing of its original overlords. West of the passage the deep, dark Brambwyn is shunned by most, though opportunistic loggers and traders brave its shadowy recesses, and fierce inhabitants. Here whole groves are slumbering dryads, and their stone circles and standing stones dot the landscape. In places the branches are decorated with skulls and the briars nourished with blood, but in other places the trees have bark hued shining-golden, and canopies of dazzling silver and startling orange, and the beauty of the wood is enough to take the breath away from a wandering intruder. But intruder the traveller is, and if the xenophobic natives cannot eject him by guile - with false trails and dense undergrowth - then they will gladly do so by force. 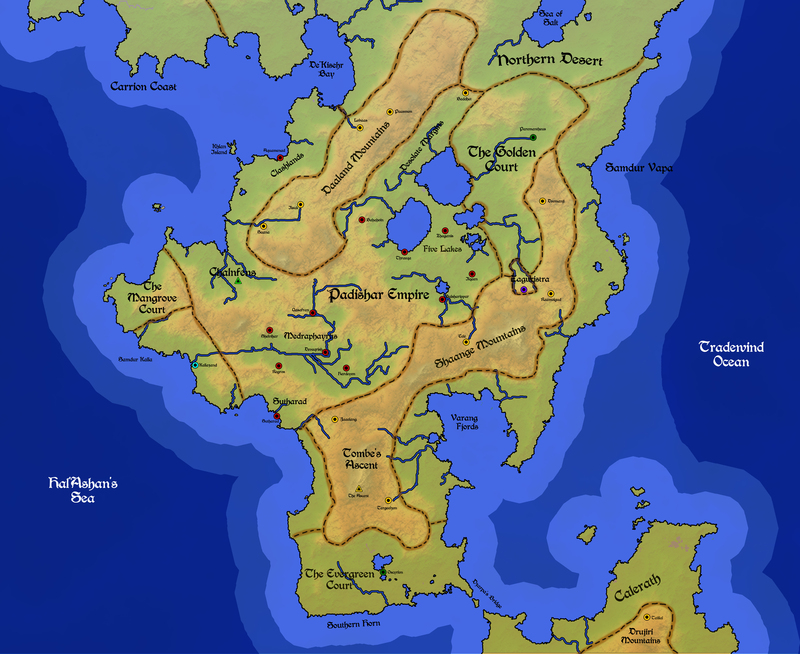 The heartlands of Zenth are also the breadbasket of the Padishar Empire. Five Lakes in the north is the most fertile and densely cultivated land to be found anywhere in the world, and orcish farmers can be seen on mass in their fields, either toiling with their own hands or, if they have done well for themselves, overseeing indentured labourers and slaves. The two enormous western lakes see the farmland on their fertile shores thin as they approach the Desolate Margin, but the smaller lakes, even right up to the edge to the forest, are tilled and turned and planted. The land here is gently rolling hills, and would have one been grasslands, but the orcs have used every inch. Of course, this has driven away the herds of orox and antelope that once grazed here, and the natural predators who have stayed have become especially troublesome and desperate. Past the polluted metropolis of Bulsharippur, capitol of the Empire and seat of Shar Qamahl Ata'orq XVI, the hills rise up and the land is rough, and mines and quarries are more common, and south of here the orc homeland, the massive fertile vale called the Medraphayrus Valley. This land is filled with history, full of ancient and historic cities of buildings that have been repaired, extended and modified until the original is scarcely visible underneath the skin of extension and improvement. This land has been the site of some of the bloodies and most adamant struggles between orc and goblin in the early days of the ancient enmity between those races. Battlefields of old bones and broken weapons are raised by slave plows on a regular basis, and old forts have become expansive walled plantations of some of the oldest and most influential orc families (those who have maintained at least moderate political power for more than a couple of generations). The heart of the valley, and indeed the heart of the entire empire is the river Uzay, known to the orcs as the beloved Mother of Seas. This waterway makes their homelands so fertile, their crops so rich, and their race so numerous and prosperous. Orc scholars on many occasions have said, with just conviction, that this river is all they need to dominate the world. Much myth surrounds the Uzay, but the most common is that it is the source of all of the world's water, for a spring deep within the valley, and that its water is the purest in the world, and will heal any who bathe in it of any affliction. Of course, this only extends to orcs in many tellings. Far to the east of the Five Lakes, outside to bounds of the Empire, floating in the sky over the Twin Rivers valley, suspended on three massive silvery chains, each anchored to a mountain peak, hovers the immense silvery disc on which Zaguristra, the Splendid City, city of the sorcerers, the legendary floating fortress. A city of polished metal, graceful spires, towering monuments and cavernous vaults and libraries hovers by ancient magic in a small tract of territory to which the sorcerers lay claim. Few cross the council of nine, who rule the Splendid City through a combination of arcane might and political clout. Even the orcs fear that if the flying fortress were unleashed that it could bring their empire low. A few mixed citizens, often refugees or other outcasts, make their homes in the pretty farmlands in the shadow of the city. The sorcerers exhibit little interest in them, but demand tribute in goods in return for the protection of their borders. Even the dryads whose forest extends around half of the border, never harass citizens of this idyllic vale. The eastern coast is claimed by none of the great powers of Zenth. The dwarven free cities of the Shaange Mountains are the smallest, most rugged and isolated of dwarf communities, because the passes through the Shaanges lead to nothing but empty coast. The dwarves here enjoy their isolation, welcoming elf traders with goods that it would be inconvenient for them to source, but seeing little of orc, goblin or dryad, even where their territory dips into the Golden Court's range. These dwarves are more contemplative and ascetic than their western brothers, and more philosophical than their faithful brethren to the south. The mountains are higher, and more rugged than the Daalands, and many dwarven cities are built on high plateaus overlooking dry valleys, with temples high above them, accessible only by winding, narrow paths next to sheers drops, terrifying to all but the dwarven natives. Many sorcerers make their homes in these mountains, and the majority of dwarf sorcerers live in these cities, perhaps accounting for the generally more intellectual outlook of these isolated creatures. The Samdar Vapa, sometimes known as the Empty Coast or the grasslands, is formed from the grassy foothills of the Shaange range descending into the sea. Here those who do not wish to live under the rule of any king or emperor live, be they isolated hermits, communities of elf traders plying their trade up and down the coast to their desert home and back, or goblins who would rather hide from the world than indulge in the vengeful uprising that their brethren have embraced. Indeed, the marginal majority of communities are such goblins, and in them a traveller catches a glimpse of what the goblin race may once have been - hunters and gatherers who grow small crops of root vegetables on their well-hidden freeholds and live off the land. In the south around the Varang Fjords, known to locals as the Bay of Terror, a large tribe of orcs live. But these creatures are not the civilized, cultured creatures of the empire, but a barbaric warrior people who live by raiding nearby settlements, even braving small dwarf enclaves, and by setting out to sea on their crude longships and waylaying elven traders, even straying so far south as Dzarpa's Bridge! These varaorgs, or terrible-orcs, have little in the way of craft, but most have pillaged a fine weapon and some elements of armour, and their warrior culture makes them every bit as dangerous as the Shar's cataphracts. Add to this their love of the sea, and ability to raid from the coast and then vanish in their ships before a proper alarm can be raised, and the threat that they pose might explain why the east goes largely unclaimed. Unlike the largely empty east, the west is a hub of conflict and activity, and is home to some of the most tenacious and ruthless warriors to be found anywhere in Zenth. Embittered orc veterans, amoral goblin assassins and cutthroat elven corsairs, with the addition of a makeshift pirate city in an untamed no man's land means there is scarcely a mile where the threat of death does not lurk in some form or another. Add to this the natural dangers of the swampy Chalnfens and their vast array of unpleasant natives, and the west is a place few would choose to settle - yet many must. The northernmost part of the region is the land known as the Chalnfens, or the Goblin Swamp to those who have no respect for its real name. While the Shar of the Padishar Empire claims this land, it is in name only. Attempts to settle these feted swamps have been made, but settlers not immediately driven out by the massive black anacondas and the deadly six-eyed swamp spider were massacred by goblin blades. Now it is a wasteland, considered little more than a thoroughfare to the Clashlands. Orc goods and civilians travel through here under heavy guard, and even the patrolled routes are like running a gauntlet of traps and ambushes. The goblins especially like to target supply convoys, because their infrastructure is in a state of collapse, and a rich orc military convoy can keep them in the field for years if carefully husbanded. Legend says that somewhere in the swamps the temple-city of Yuthgraki is hidden by the magic of rogue sorcerers and ancient goblin tricks, protected by a labyrinth of traps and dead ends cunningly hidden under the drifting and disorienting marsh gases, but none have yet found this fabled bastion of goblin resistance. Some jannissary battalions have gone looking for the city for months on end only to return with no clues. Sometimes entire battalions simply don't return. To the west the swampy land continues into the Flodday Woods, home to the Mangrove Court. A circle of wise Archons saw their territory shrink and their forests die during a series of natural disasters some three millennia ago that flooded much of the forest with massive waves, then the orc and goblin war effort pressed into the forests for resources and shelter. Finally, unable to take any more destruction, the Archons were faced with a decision; lose lives trying to fight back, or begin to participate in the world as the other races do. As a result the dryads and archons of the south have had a little contact with other races, and have formed a close bond with the goblins who occasionally pass through their lands or shelter along the wood's edge. They are more inquisitive and welcoming than their eastern brethren, and while they are secretive, and make it clear that exploring many parts of their home still means death to outsiders, they are also curious about the vengeful goblins and imperialistic orcs who are their neighbours, and the capricious and whimsical elves who occasionally land on their coast to barter for timber, so much so that small communities of goblins have been invited to establish themselves within the woods, where they have formed small hidden communities that may one day be the salvation of the goblin race. Though there are strict rules about protecting the resources of the woods, the goblins have proven able to live in harmony with the land nearly as well as the dryads, buildings villages in the canopies of living trees. South of the wood, at the mouth of the Uzay, along the Samdur Kalla, dwarf-pidgin for the Black Coast, there is a stretch of no-man's land. Rocky, nutrient poor soil, a lack of mineral resources and proximity to both the Chalnfens and the Mangrove Court has meant that the empire has shown little interest in this stretch of sparse, grassy coast, and the land has a slightly sickly look about it. The monster waves that battered the Flodday Woods also struck here, sowing much of the ground with salt water, and leaving brackish salty sinkholes that kill the vegetation all around them, like a festering sore in the landscape. But at the mouth of the river there is something remarkable. The pirate haven of Kallazand - the City on the Black Silt - has been cobbled together on the Uzay delta by sinking vast amounts of stone and debris into the sodden earth, then piling sand brought all the way from the desert and gravelly earth atop it. The city began as an anchorage for elven corsairs raiding the south-western coasts, and grew into a series of unmanned strongholds around the river mouth where they could store plunder when their holds were filled to bursting. It soon became a crossroads for thieves, black-marketeers, merchants and outlaws, who gathered around the elven forts to make camp away from the eyes and laws of other nations, to exchange goods stolen or fairly traded. With an influx of goblin refugees and dwarf expatriates following the Padishar Empire's occupation of the mountains and swamps the place grew, bolstered by orcish renegades from the old kingdoms of the Medraphayrus. The various elven pirates return to their strongholds perhaps once a season at most, and have taken to styling themselves corsair-lords, though they are neglectful and absentee rulers at best. When moored in Kallazand they hold court, settling disputes with a capricious iron hand, taking tribute and distributing largess to their followers before returning to the sea. But all defer to the vicious pirate Alyh Rala'Byn, terror of the west, and when his towering orcish battleship the Banebringer - stolen from port at Sutharad -sails into port the other corsairs set quickly to sea. The result is a prosperous anarchy that the corsair-lords fight to maintain, making the city the most dangerous and chaotic anywhere in the world. It is said that, no matter what your fancy, or how black your soul, you will find welcome in Kallazand. The south of Zenth, from the base of the Shaange Mountains to the Southern Horn, is one of its most rugged an inhospitable parts, though two nations claim territory here - the dryads of the pines and firs, and the empire's southernmost outpost at Sutharad. It is home to the tallest mountain on Zenth, the enormous Tombe's Ascent, from which the mountains surrounding get their name. Legend has it that this imposing peak was climbed by the first dwarven prophet, Tombe, who meditated upon the very summit for a year and a day and found true enlightenment. And the most devout and introspective of the dwarves follow in his footsteps even to this day, on a pilgrimage so demanding that scarcely a third return alive. Tombe's Ascent is not a populous region, but it is vitally important to the heart of every dwarf on Zenth, and they would gladly give up every other land that they claim to hold this sacred mountain. To the south, the most isolated of the dryad race, and also the most numerous, the dryads of the Evergreen Court dwell in Geirnhoel Forest. Rugged taiga stretches from the foothills to the coast in nearly all directions. The Evergreen Court are a group of dryads who will actually march out of their forest home in force to pillage and wreck havoc against any civilization. After generations of conflict with the violent varaorgs the dryads of the Evergreen Court became violent and vengeful. Angry, isolated Archons eventually reacted to increasingly bold intrusions by ordering their offspring out in force to slay any who they found nearby the forest, and every full moon this hunt begins again, with the dryads ranging as far as they can in the space of the night, and returning with any dwarf, elf, or orc they find as little more than a grizzly trophy. Of course, this has only earned them the ire of both the orcs and even the usually impassive the dwarves, and both have started a careful campaign of forest fires so as to see dryads coming, and of raiding into the forests to make their borders clear to the dryads. It is said that meditating atop Tombe's Ascent, some three generations ago, the dwarven warrior Dzarpa Taiilal saw the clouds part below him, and the mandala shone a clear path to the southeast, illuminating the distant peak of a new mountain to the south. Immediately taking this as a vision, he returned to his city, and persuaded many of his brethren, through the clarity of his reason, and the conviction of his words that he had been given a prophetic quest - to visit this mountain and found a new temple upon its shoulder where the lights shone brightest. Many chose to follow him on his great quest, and such was his passion that he was even able to convince the dryads to give he and his followers safe passage south to the coast, to reach this new mountain. However when he reached the coast his dwarves, unskilled in seamanship or boat building, could go no further. Many began to lose hope, but Taiilal promised that if they would sit in meditation for a month in that place, the universe would provide. And a month to the day after he made his prophecy, a large flotilla of elves sailed into view around the point on which the dwarves waited, and looking to trade they came ashore and hailed the dwarves, surprised to see them away from their mountain homes. The rest is a matter of history. The elves, in a show of unity rare between two such differing races, agreed to guide the dwarves across the waters around the southern horn and to the base of the mountain, and then the elf leader Asisah made an oath to return to that place every year with goods to trade with the dwarves for as long as she lived. Today a city bearing Taiilal's name does indeed rest on the shoulder of the mountain, and the elves still return, for Asisah of the Ul'Taheer lives still, as young as the day she and Dzarpa Taiilal met, and Calerath's dwarven population stands as testament that the races of Zenth can work together to achieve great things.